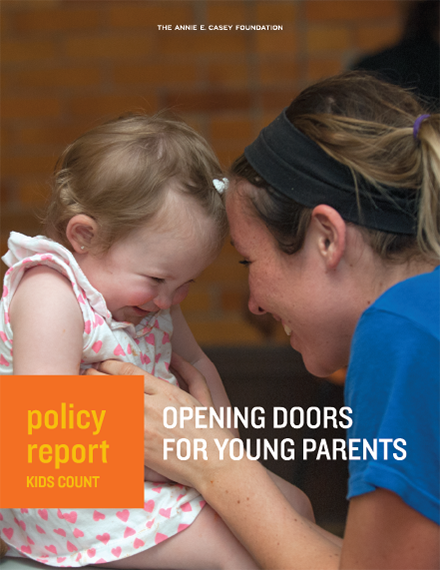 With limited access to opportunities to advance their education and find family-sustaining jobs, Virginia’s 60,000 young adult parents face hurdles to support their children and fulfill their own potential, according to Opening Doors for Young Parents, the latest KIDS COUNT® policy report from the Annie E. Casey Foundation. As the Casey Foundation’s KIDS COUNT grantee in Virginia, Voices for Virginia’s Children, joined the call for action so these young parents can contribute to the state’s communities and economy. The fifty-state report reveals that, at eight percent, Virginia is below the national average (10 percent) of youth ages 18 to 24 who are also young parents. 68,000 children in Virginia have young parents ages 18 to 24. 69 percent of children of young parents in Virginia live in low-income families. Only 12 percent of young parents ages 18 to 24 have completed an associate degree or higher. 51 percent of Virginia’s young parents are people of color, facing challenges exacerbated by discrimination and systemic inequities, with their children standing to suffer the most. Opening Doors for Young Parents illuminates the most common obstacles young adult parents face, including incomplete education, lack of family-sustaining employment opportunities, lack of access to quality child care, inadequate and unstable housing and financial insecurity. Voices for Virginia’s Children further stresses the importance of helping the state’s young parents access educational and employment opportunities. In an increasingly competitive workforce landscape, education can make a significant difference in earning power for families.